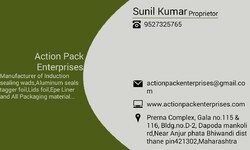 Action Pack Enterprises is counted amongst the most promising Manufacturer and Supplier firms improving access to quality Aluminium Foils and Wads since its inception in the year 2011. We work with our esteemed clientele to garner their complex needs with our offered broad range of quality approved products, such as Aluminium foil Circles for pet and Hdpe jar, Aluminium Tagger Foils and Cork Wads. Our mission is to create a strong client base by delivering measurable results, and we do this by developing an environment friendly product range that features characteristics of robustness, durability, temper and heat resistance, sunlight resistance, high load bearing efficiency, ease of transportation and competitive price bands. Our organization was founded on the highest standards of business ethics, which is why our offered products are widely demanded for its remarkable quality by various industries such as pharmaceutical, oil, chemical, food and beverage, packaging, cosmetics, automotive, and agriculture. Moreover, we invest in technology solutions and programs to empower our people who strive to uphold highest levels of customer satisfaction by developing innovative quality. Our core values of integrity further strengthened by the industry’s most recognized vendors and logistics support, which equips us to cater to quality and cost efficiency needs with timely awareness. The vigilant guidance of our leader and mentor Mr. Sunil Kumar depicts his unwavering focus towards client satisfaction. He motivates us to optimize our potentials to bring forth competitive products. Manufacturing and Trading of Aluminium Circles, Blister Aluminium Foils, Aluminium Tagger Foils, Cork Wads, EPE Liner Wads, Aluminium Lids and Wads and Aluminium Seal Foils. Industry : Manufacturing & Supplier of Induction Sealing Wads Printed And Unprinted) Wads, Induction Wads, Wads Liner , EPE Liner, Aluminium foil Circles / Aluminium Tager Foils, Cork Wads, Aluminium Lids foil, Lids Sealing foil and Aluminium Seal Foils. Wads, Induction Wads, Wads Liner , EPE Liner, Aluminium foil Circles / Aluminium Tager Foils, Cork Wads, Aluminium Lids foil, Lids Sealing foil and Aluminium Seal Foils. Our governance and ethics are the founding pillars of our rapid growth. Our day to day business operations reflects our unswerving respect for ingenuity and transparency. Moreover, we invest in leading technology to make the quality products viable at nominal price bands. Our company is creating a consistent framework to sustain the environment for generations to come, which indeed helped us to nurture enduring relationships with a huge client base. Our commitment to quality is exhibited in our well integrated infrastructure that comprises of most valuable business process and technology headed by skilled people. We invest in upgrading our infrastructure that is strategically designed to leverage the prevailing manufacturing technology for aluminum foils. Moreover, our factory base is covering a wide area and parted into highly advanced units for R&D, manufacturing, quality testing, packaging, stocking and distribution. Our business decisions are guided by the environmental concerns and quality policy defined by our founders. Wherever we operate, we abide by the rules and regulations that depict our concern for highest standards of quality compliance. Our team work hard to source the best suited inventory of raw materials, which is further tested on the basis of its quality and purity. Besides, our team of quality control associates undertakes the responsibility to verify the performance indicators of our developed eco-friendly product range. We are Leading Manufacturer and supplier large quantity as well as small quantity. Our workforce reflects rich diversity in backgrounds and perspectives. Every member in our team is highly dedicated to add value to the company by upholding the core values of integrity and accountability. Furthermore, we foster a collegial work environment to bring forth innovation and quality with the combined efforts of our highly experienced R&D specialists, manufacturing experts, warehouse managers, skillful distribution personnel and the trained workforce.